The Alice & Olivia sample sale just opened to the public at 260 Fifth Avenue, and we stopped by the preview last night to check it out. The designer's signature girly aesthetic is on full display here, with plenty of sequins, beading, and gorgeous prints on dresses, skirts, and tops. We were hoping to see more pants, but the selection we found isn't anything to be miffed about. The sale is organized by size, with 0/XS just to the left after the doors, and 8/M and 10/L to the far right. While all sections have the same styles, the smaller sizes have the greatest quantity of items, with 8s and 10s having only two racks each. Apparel pricing is based on original retail price and starts at $39 (for clothing that was originally up to $99) and tops out at $299 (originally $1,300 and up). In between, apparel that was originally $100—$199 is now $79; $200—$299 items are $199; $300—$399 items are $149; $400—$499 items are $199; $500—$599 items are $269; $600—$899 items are $279; and $900—$1,299 items are $289. 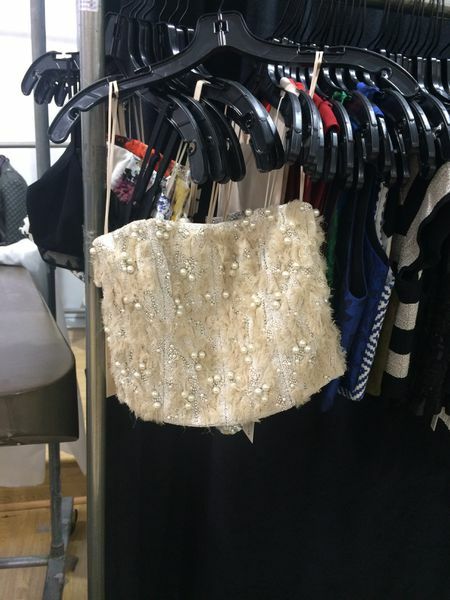 There are a fair amount of crop tops, especially in the 0/XS section, including a white beaded style ($279). A blue fur-trimmed knit vest for $269 (was $597) also stood out among the tops. There are plenty of blazers and jackets, and we noted a white style with gold beading priced at $299 (from $1,998). The coat selection is pretty great, with options ranging from a green jacquard trench coat ($269) to heavier walker coats. However, the selection of blouses is not at all impressive, with long-sleeved styles featuring lace panels being the most prevalent. We did spot one black and white ballerina-print blouse ($119) in the mediums, though, that was an exception to the blandness. Dresses range from party-ready sequined A-line styles to work-appropriate sheaths, and all of the gowns are in the back left corner. Styles of note include a dark purple floral gown ($299), a wonderfully flowy gold gown with a deep v-neck ($269), and a black gown with leather-trimmed cutouts at the waist ($279). For bottoms, there are more skirts than pants. We noted a dark green snake-embossed leather mini skirt ($269), a mid-length silver skirt ($199), and a pleated leather skirt with an enchanting hummingbird print ($279). We saw a few different styles of printed pants, with a mosaic-printed pair standing out ($119) among plain black trousers ($119) and leather flares ($279). The samples are in the back of the space by the fitting rooms. Most pieces looked disheveled, and shoppers last night seemed disappointed with what was being offered. The majority of samples are $49, with notable exceptions including pants ($39), dresses ($59), coats, embellished items, and leather items (all $99), and gowns ($119). We did find a green printed blouse ($49), and a leopard-print faux fur coat ($99) that were worthy of being scooped up — which might have already happened. Sweaters are in bins based on size on a table in front of the stairs. There are a few bins of belts ($29) on that table as well. Bags are also to the left, towards the registers. There is a dazzling selection of clutches ($99) and bigger bags ($109), with a few mini bags ($89), and small leather goods like wallets and small cases ($39). There are only a few necklaces ($39) right by the register, next to a tray of underwear ($10) and a bin of tights ($19). Shoppers at the preview were stocking up, so we suggest heading over to shop as soon as you can. The sale runs through Sunday at 3pm, and you can check out the Dealfeed below for more details.